It all started at a Holiday Market in 2007. As we were taking care of customers, Local Artisan's were talking about how great it would be to have a shop that would carry thier products year around. As we locked up and started walking on 3rd Street in Historic Downtown McMinnville, we came across an empty store front on the corner of 3rd and Evans. As we looked through the window, visions of a local store with a variety of unique gifts, gourmet foods, and wine started filling our heads. 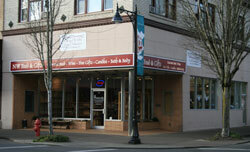 Thus, NW Food and Gifts was born on March 1st, 2008. A family owned and operated business in beautiful Downtown McMinnville, Oregon we pride ourselves from many generations of knowledge about how to take care of customers and offer only the best in products and service. Gourmet food, wine and local artisan gifts have always been a passion for us and we show this with each product that we send out to our customers. To provide only the very best in Northwest products while providing excellent customer service, continuing to be innovative, while listening to our customers and striving to be better each day. We want our customers to be happy with their purchase with NW Food & Gifts. If for any reason you are not satisfied with any of our products, please call us and we will make every effort to resolve the issue. Thank you again for choosing NW Food & Gifts. We appreciate your business!